Inspired by a 70-page slice of War and Peace, this "vibrant, thrillingly imagined new musical" (NY Times) is "stunning and blazingly original" (Entertainment Weekly) and brings us just inches from Tolstoy’s brash young lovers as they light up Moscow in a “heaven-sent fireball" (NY Times) of romance and passion. Natasha is a beautiful ingénue visiting Moscow while she waits for her beloved fiancée Andrey to return from the war. In a moment of indiscretion, she is seduced by the dashing (but already married) Anatole and her position in society is ruined. Her only hope lies with Pierre, the lonely outsider whose love and compassion for Natasha may be the key to her redemption… and to the renewal of his own soul. "One of the decade's best musicals" (Time Out NY), The Great Comet has "rousing music and ravishing performances" (Daily News) with a groundbreaking score that mixes rock, pop, soul, folk and electronic dance music with classic Broadway. 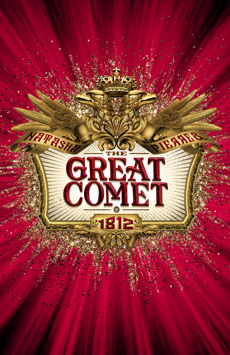 The Great Comet arrives fresh off its sold-out run in Boston and its critically acclaimed 2013 Off-Broadway premiere. Its renowned creative team has reimagined the Imperial Theatre as an opulent Russian salon, where every seat provides a unique perspective and an unforgettable experience which is "thrilling, a feast for the senses" (Associated Press) and "inventive, ravishing and full-on romantic" (NY Post).